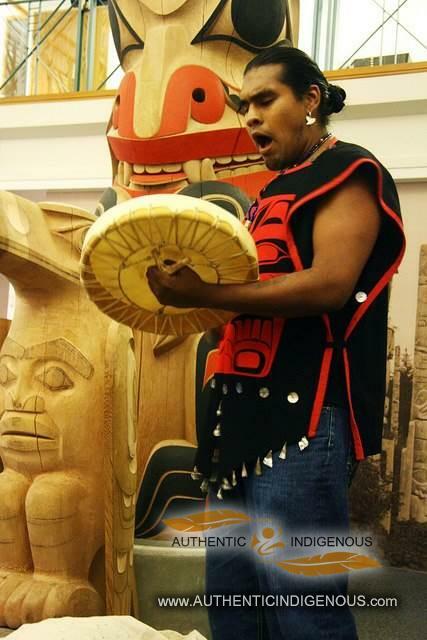 Ernest Swanson, who holds the traditional Haida name, Giinowaan, is a Haida artist from Old Massett, British Columbia, who currently lives in Vancouver, BC. As a matrilineal descendent of iconic Haida artist such as Charles Edenshaw and a grandson to the late Rufus Moody, Ernest continues his family’s legacy by creating traditional Haida art. In 2004, he began to work with artists such as Jim McGuire, Christian White and Chief Edenso “James Hart”. Ernest has continued to display his works on regional, national, and international scales, working in wood, silver, gold, and argillite. Ernest has a passion for working with youth, and has worked diverse youth groups in HIV/AIDS awareness, mural paintings, drum making workshops, Haida language and history, dance classes, traditional storytelling, and designing workshops, with organizations including the Vancouver Aboriginal Child and Family Services Society, Aboriginal and Northern Affairs Canada, and the Old Massett Village Teen Centre.